Do you feel like you're running from one event to another to promote your services, without seeing your business take off? Are you wondering why your client is not returning after several months, making you doubt about your work space and your service standards? A CBInsights analysis of 101 failed startups polled the reason why a business failed according to their founder. The study revealed that a surprising 14% failed because they ignored their customers! If you don't want to be part of that group, there is one essential thing that you should be doing, since the day you started having clients: To invite your clients to offer their honest feedback and follow up on it. It would be very difficult for a client to give a real answer if all you do is ask: How was everything? 99% of the time, the answer will be: "Fine." Even when it's not, because either the person does not want to confront and offend you, or because it's just the easiest answer to give. And then they stop coming, or they come less often because they found another alternative. You do not want to leave an unhappy client, unhappy. Client referrals are your gold mine. It brings you new clients effortlessly and for free! Thus, you need to pay extra attention to giving ultimate satisfaction. It will show that you care, and your clients will respect you even more for the standards you try to uphold. It will release you from wondering whether they are completely satisfied or not. It provide you with a clear vision of what you need to improve in the different aspects of your client experience. If a customer was unhappy, you will have a chance to contact him/her and make it right, instead of losing him/her for good and getting bad publicity. It will give you credibility as a committed business owner. Feedbacks can be recycled into testimonials for your social media feed and help you generate new customers. When I saw the first comment, I immediately rechecked our service cycle. Want to have access to the exact template we use to collect our clients' feedback? 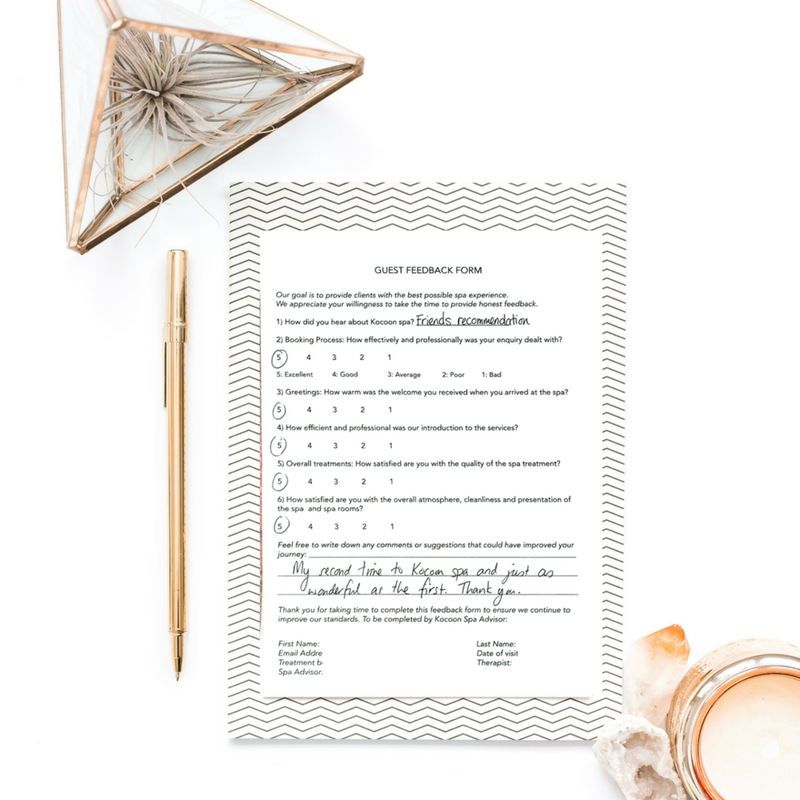 Click the magic button and you'll receive the template instanta in your inbox, the mini feedback form ready to be customized to your brand, in Word and Page format. After their spa treatment, we offer a complimentary tea ritual, and discreetly put on the table a small feedback form to hint at it without imposing. Some businesses have the forms sealed by the client so they can be sent directly to the headquarters. But I prefer not to, as I like our staff to be able to see immediately their performance review and be able to act upon it. 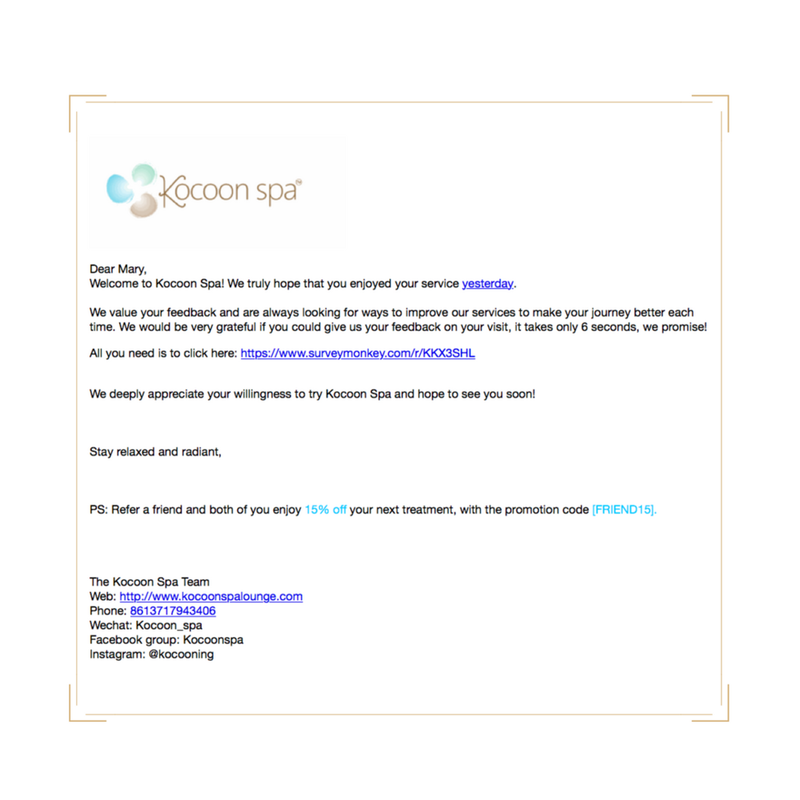 A day after their visit, our clients receive a thank you email automatically generated by our booking system (We use Mindbody). The email includes an invitation to leave a feedback with a link to an online survey (We use SurveyMonkey and it's free!). Don't have a booking system yet? Draft an email template and customize it with the client's name each time you send it. Every week, we collect a dozen feedbacks, and that is such an important database for our service improvement. Because we take our clients' opinion very seriously, we have been voted as The Best Spa in the city for 3 consecutive years since the inception of the award! We use the comments in our social media, for our employee appraisals, we can also pinpoint issues that needs to be addressed urgently. If the answer is yes, it would mean the world to me if you could press "share" on one (or more) of those social media buttons, to share it with your social circle. Wealth is only meaningful when shared!